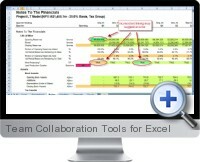 Excel Team Collaboration Tools (Spreadsheet Studio) combines a set of integrated visualization tools designed to assist with the navigation, auditing and collaboration of formulas within Excel models built in team environments. This free Excel add-in allows to quickly identify and communicate potential errors within complex Excel models to increase efficiency and reduce business risk propagated by incorrect analytic structures. Navigation tools allow the detailed and logical auditing of formulae by tracking paths and breakdown of components with color coding and value display. Errors are identified quickly for adjusting and correcting. Visualization tools analyze the calculation structure of the Excel model and highlight formula characteristics to give a clear understanding of the logic. Formula consistency analysis color codes cells based on calculation flow and highlights potential errors based on the overall logic. Dependency analysis highlights cells with internal and external formula dependencies to assist with error identification from external sources. Heat maps compare cell logic with adjacent and surround cells to identify possible errors within a worksheet. Input cells and calculated cells can be automatically differentiated with formatting styles. Collaboration tools assist with managing tasks and communicating information to team members working on the same Excel model. An advanced commenting system allows users and team managers to create and view detailed information on the cell level. Information for collaboration can include team member task assignment, categorization, prioritization and saving of cell values. Team members can add replies to advanced comments as a change log. Normal comments appear to users without the team collaboration tools installed.